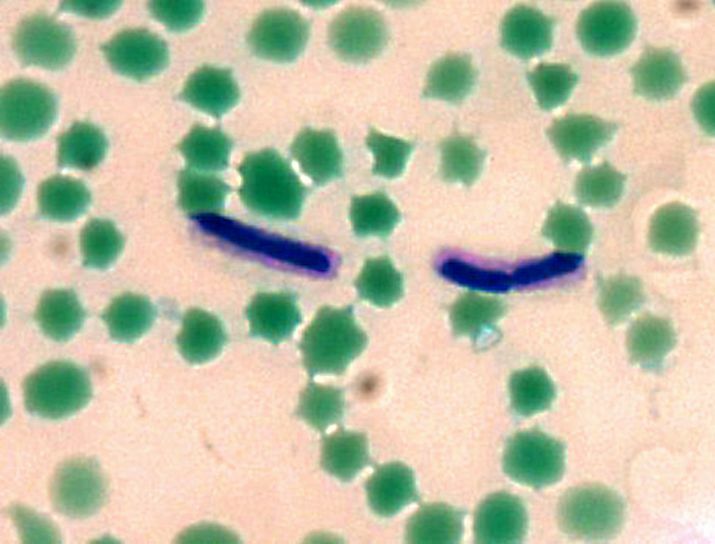 Some bacteria like Bacillus anthracis have a well organized layer of material lying outside the cell wall referred to as a capsule (or K antigen). What really differentiates a capsule from any other material that may form on the surface of a cell wall of other bacteria is the fact that capsules are well organized layers that cannot be easily washed off. Typically, a capsule is composed of capsular polysaccharides (CPS) which are polysaccharides. They may also be composed of a number of other materials such as poly-D-glutamic acid. For some bacteria, capsules are very important in that they are a major virulence factor. As such, they protect the bacteria from phagocytic actions of such cells as neutrophils allowing the bacteria to thrive. This is achieved due to the fact that the capsule is very smooth and has a negative charge that prevents attachments/adherence. Capsule stain is a type of differential stain which involves the use of two stains; primary stain and the counterstain. Here, it is worth noting that for most part, capsules are non-ionic. As a result, acidic and basic stains will often fail to adhere on to them. For this reason, it becomes necessary to stain the background using an acidic stain while the cell is stained using a basic stain. When viewed under the microscope, the background will be dark as a result of India ink, bacteria cells will be purple having taken the crystal violet dye while the capsule will be clear against a dark background given that it takes no stain. * Nigrosin is recommended to India ink because it gives a more even background and spreads more easily. This is a positive staining method used in capsule staining. Here, the smear/sample is treated with a hypertonic solution (copper sulfate) for the purposes of creating an ionic difference that ultimately results in the diffusion of a stain towards the outer surface of the cell. After the slide is air dried, it becomes possible to observe the stain that remained on the capsular layer. Here, one will see a dark violet color of the cell and a light violet color of the capsule. Unlike endospores, capsules are more delicate. For this reason, using heat during the staining process should be avoided given that capsules would be easily destroyed. Rinsing the slide with water is also avoided in capsule staining because it would dislodge the capsule. However, a drop of serum may be used on the smear to enhance the size of the capsule. This helps make it more visible to the technician under the typical light microscope. Given that this is a sensitive procedure, sterile technique should be used when obtaining the sample and introducing it onto the slide. This prevents any contamination and helps determine whether the sample really has any bacteria capsules. As previously mentioned, capsules are considered to be the virulence factor which means that they enhance the ability of a bacterial to cause a disease. With a capsule in place, the bacteria is protected from such body defense cells as macrophages. Therefore, it becomes easier for the bacteria to thrive and cause diseases. For this reason, capsule stain is of great benefit in that it helps identify the presence of capsules and thus allowing healthcare professionals to recommend the right treatment. Learn more about Cell Culture, Cell Division, Cell Differentiation and Cell Staining.